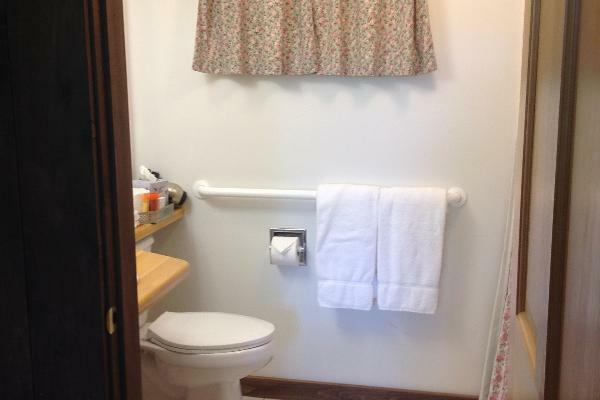 First floor room, handicap accessible. Private en-suite bath with full tub and shower, ceiling fan, cable TV, WiFi, hair dryer, and coffee maker supplied with Wolfgang Puck organic coffee and Numi Organic tea. 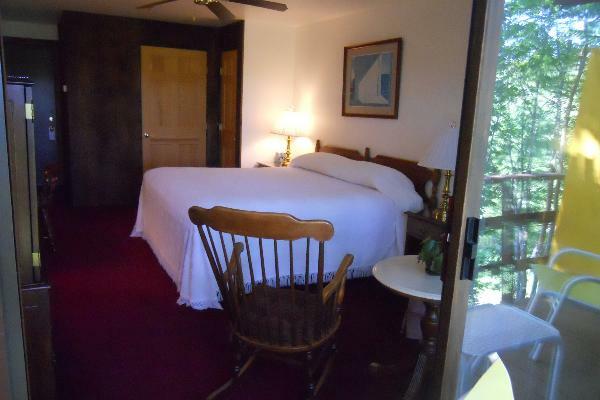 Room is decorated with plush bedroom carpeting, homey patterned triple-sheeted beds with Maine Heritage Weavers (Bates) white heirloom bedspreads, and furnished with several pieces of Maine made furniture by Moosehead. DVD player, iron &amp; board on request. 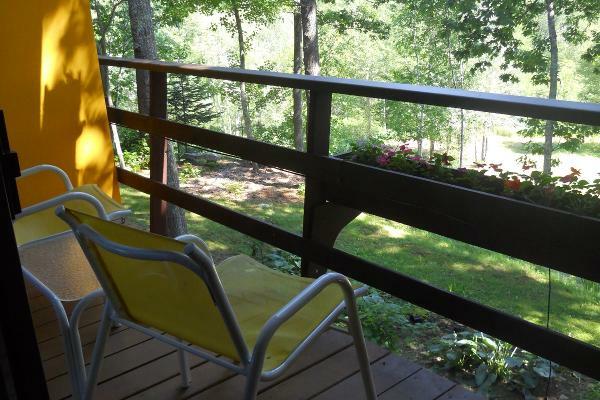 8 ft. sliding glass door to your own deck with partly sunny/shady views of the field and forest, flowers and beautifully landscaped grounds. Shady view of the field and forest. Maximum occupancy in this room is 2 people. per day Rates are based on two people per room. Deduct $10.00 for single rate. Extra person fee is $30.00. 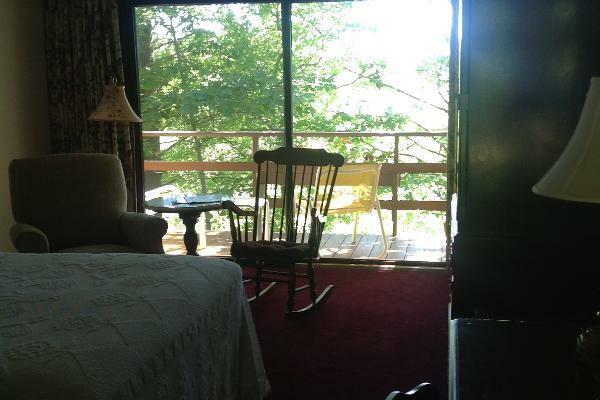 For a stay of two or three nights, enter 10% in the Discount Code box. For a stay of four or more nights, enter 15% in the Discount Code box. We do not offer discounts over holiday weekends. 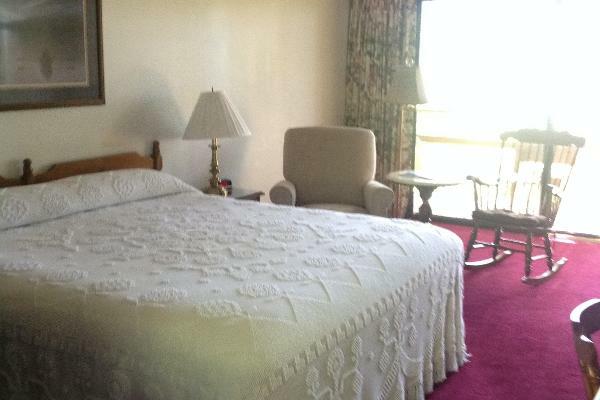 per day Rates are based on two people per room. Some rooms can accommodate an extra person. Please inquire. Extra person fee is $30.00. per day Rates are based on two people per room. Some rooms can accommodate an extra person. Please inquire. Extra person fee is $35.00. per day Rates are based on two people per room. Some rooms can accommodate an extra person but you must inquire first. Extra person fee is $30.00. Discounts are not offered over holiday weekends. For a stay of two or three nights, enter 10% in the Discount Code box. For a stay of four or more nights, enter 15% in the Discount Code box. (10/16/19 - 5/24/20) Thank you for sharing our 42nd year in business. We look forward to seeing you in 2019!